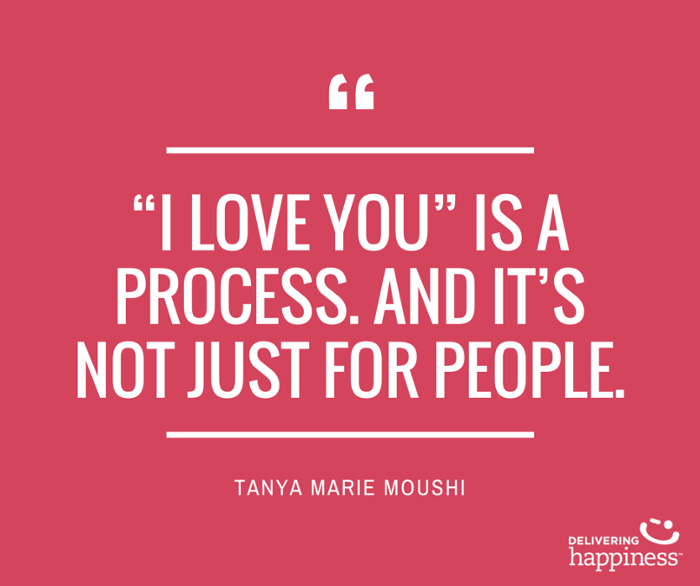 Heads up: “I love you” is a process. And it’s not just for people. It’s for companies, organizations of all sizes. It’s not cyclical in the way we think about other processes. It works more like a drop of water in a still pond. It shakes things up, and at a time where business seems to be synonymous with cold, hard systems, it gives blood to an organization. “I love you” is about care. It’s the process of putting clients first and sometimes, those clients are your employees. Hugh Macleod calls it “the new hard currency.” It’s how we pay for things, and it’s just one of the ways your company pays its people, and also the way your people pay your customers. “I love you” means I care for your long-term well-being. It asks, “How can I help?” And listens with an abiding fear for body language and subtleties. It tries to think of things before you think of them and makes you smile by the virtue of the interaction, and it sticks with you in a way that makes you talk about it long after you’ve had the experience. Imperfect at times, the process requires that you learn more about who you’re serving, that is, who you’re loving, and figuring out how to love them best. When this is the way you move about your company, how you come into meetings, how you pitch a sale or close a deal, or even follow up for feedback, the human on the other side feels it. And so do you. That’s the magic of loving your people. It’s your invisible development strategy that also develops you. It incorporates giving as a business model, sharing as a sales strategy, and transparency as a marketing plan. The mission statement includes empowerment and support and most importantly, trust. “I love you” requires you to tell the truth. It requires you to solve a problem genuinely. It also requires you to make the person on the other end happy, simply because you want to, because that’s the caring thing to do. When you treat business like it has the power to change the world, it does. Ergo, your new business plan: Love. This post was originally written for and published by my amazing friends at Delivering Happiness, which can help your company's culture shine.